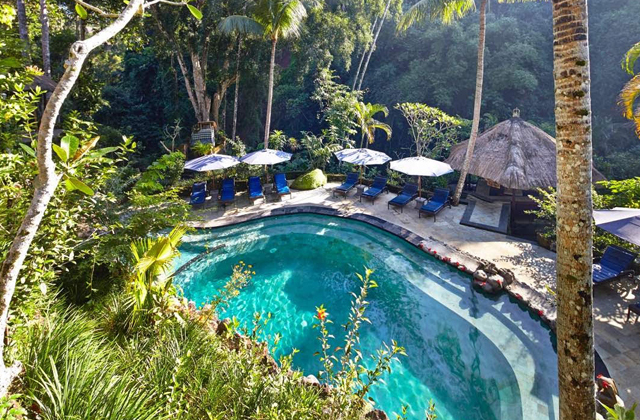 The Tjampuhan Hotel is a legendary hotel with the longest history in Ubud. It was established in 1928, and is loved by many artists. Surrounded by a tranquil forest, this luxurious hotel allows visitors to enjoy beautiful views of Tjampuhan’s river and valley. The spa in the hotel offers a heated swimming pool, whirlpool bathtub, sauna, and steam room. From the restaurant's terrace seats, you can enjoy a delicious meal while taking in the picturesque scenery. There is also a popular ridge walk (promenade) nearby called Bukit Cinta (The Love Hill). Set Lunch served with Mineral Water. Cold towel and welcome drink upon arrival.Using public pool or spring pool.Towel service at pools.Spa Facirities as hot & cold whirlpool baths, sauna and steam rooms.Locker and changing room services. Spa facilities as hot & cold whirlpool baths, sauna and steam rooms,you can enjoy max 4 Hours/1group.You have the choice of Indonesian set,International set or Vegitarian set menu.Whenever you have Meal during 10:00-18;00.